What are the benefits of becoming a Mentor Plus Mentor? The Mentor Program takes your expertise as a great accountant even further to become true business mentors. It's the perfect marriage of expertise and business acumen that will give you and your clients a distinct advantage in the marketplace. I addition to the M.B.A. and Mentor "U" training offered through our Strategic Partner, Mentor Plus, 20/20 Mentors will receive a marketing kit (including a website badge and web content), a preferred provider status listing in our referral directory, and opportunities for advanced training and support throughout the year. The Mentor Plus® M.B.A. program and Mentor "U"niversity courses are available to accounting professionals and business owners. Mentors must complete the M.B.A. program before being eligible to participate in (or offer to clients or internally to their team) the Mentor Plus® Mentor "U"niversity coursework. The Mentor "U"niversity courses are structured around the "Learn, Do, Teach" model. First you learn the concepts and apply them in your own practice. Armed with that experience, you can then teach the same concepts to your clients and and help them apply the fundamentals in their business. How can I justify making the investment in this program? A major component of the value proposition for this program is the fact that you don't have to build your firm's advisory services from scratch. It's the difference between going to cooking school and buying a successful restaurant. The restaurant owner has already worked out all the kinks so you don't have to re-invent the wheel at every turn. Yes, that makes this program more expensive than "training programs" but this not just a training program. You have to ask yourself . . . What is my time worth? How long would it take me to create all the curriculum and materials on my own? How many revisions would we undertake until the program was running smoothly? Get the picture? The cost of starting from scratch vs. turn-key program: priceless. What is the ROI for this program? 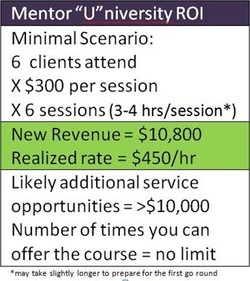 A typical small business owner might not be ready to sign on for a major consulting engagement but committing $3-400 per month to participate in your firm's Mentor Plus'® Mentor "U"niversity program" is not such a stretch. Let's to do the math . . . take six to eight business owners multiply that by $300/month times six months and you'll begin to see how quickly the Mentor Plus® Mentor "U"niversity program will easily pay for itself. Hosting just one round of the program with six of your clients will yield over $10k. Once the program is paid for, there are no additional fees and you will have mastered the learning curve on teaching the lessons. This is when the leverage model really starts to kick in because you can teach the course over and over and have it be a regular revenue stream for you. Additionally, we've never taught a program like this without it generating additional work. In fact a typical clients will spend 2-3 times the tuition cost to have you come into their business to help them implement what they learn in the program. How will I sell this program to my clients and prospects? First off, you are going to reverse the risk on this and offer a money back guarantee. You are also going to take client/prospect candidates through an initial "discovery" process to identify areas of need and concern that are holding the business back from reaching its full potential. We are going to teach you how to quantify a client's value proposition so you can easily communicate the upside potential of having them be involved in the program. BTW if you can't identify a potential upside to justify the client or prospects investment, then the business owner is not a good candidate for the program. Success in this program is as much about client selection as it is deselection. When presented properly, a client investment of $1800 to $2400 for six months of great coursework and mentoring is a great value. Which clients will benefit the most from this program? What is included in the program licensing? The Mentor Plus® Mentor "U"niversity program comes complete with a facilitator's guide, participant guide template, lesson materials, PowerPoint presentations, supplemental articles and video links to reinforce each lesson, as well as marketing letters and copy for you firm website. Additionally each lesson is pre-recorded so you can go back and listen to them as often as needed to build your confidence. Your license allows you to insert your logo on all the materials and add/modify the lessons to suit the particular needs of your clients. Your license allows use of the materials, but does not transfer ownership or resale of the Mentor Plus® Mentor "U"niversity to another party. Any improper use of the materials or copyright infringements will result in having the license revoked.